Figure 4. Phytophthora capsici present in unfiltered water is grown on petri dish. Irrigation water, from both fresh and recycled sources, is known to vector many types of plant pathogens (fungi and oomycetes, bacteria, viruses and nematodes) that infect nursery and greenhouse crops. Water treatment is often necessary to prevent the spread of disease into and within plant production facilities, and is commonly accomplished by chemical, heat or radiation methods. However, these methods are energy intensive and can result in high construction, operation and energy costs to treat the large volumes of water used for irrigation by greenhouse and nursery operations. Fortunately, potential alternatives include lower-cost and lower-energy water filtration systems that use physical as well as biological processes to treat the water. At times, the effectiveness of these lower-cost filtration units can be called into question. Therefore, we chose to investigate the ability for one type of low-cost treatment system — slow sand filters — to eliminate Phytophthora and Fusarium, which are some of most virulent nursery and greenhouse pathogens. Slow sand filters have been used for hundreds of years as a system for purifying water. They have been shown to remove a variety of pathogenic microorganisms including bacteria, water molds and viruses. Slow sand filters are famously credited with abating a cholera outbreak in 1892 in Altona, Germany. They are called “slow” because the flow rates are typically 3–12 gallons per hour (gph) per square foot of sand bed area. The total volume treated is dependent on surface area of the sand bed. Unlike “rapid sand filters,” which filter water through the physical removal of particulates and have flow rates of 120–1,200 gph ft–2, slow sand filters rely on the establishment of a diverse community of microorganisms to remove pathogens from the water. This biological community is referred to as the schmutzdecke, German for “dirt layer,” and consists of algae, bacteria, fungi, actinomycetes, protozoa, rotifers, nematodes and flatworms. Given the importance of the biological community in the ability of slow sand filters to remove plant pathogens, it seems likely that a slow sand filter may need to be adapted to the specific challenges presented by distinct pathogens. Therefore, part of this study tested the adaptability of these filters by challenging the slow sand filter with two distinctly different plant pathogens: Phytophthora capsici and Fusarium oxysporum f. sp. Lycopersici. These two pathogens were selected because of their phylogenetic differences (an oomycete and a fungus), biological differences (cell walls of β–1,3 glucans in the oomycetes, and cell walls of chitin in the fungi), and because both pathogens are readily spread by water. A critical point and a potential vulnerability in any slow sand filter system is the consistent water supply. Slow sand filters are designed to have a constant stream of liquid passing through them, providing the microbiotic schmutzdecke community with a continuous supply of water, nutrients and oxygen. If the pump fails and the water stops, the microbial schmutzdecke is at risk, which could negatively impact the effectiveness in filtering. The purpose of the study presented here was to examine the adaptability of established slow sand filters by challenging them with different biotic and abiotic stressors. The biotic challenge was to remove two different plant pathogens fed in series: P. capsici and F. oxysporum. The abiotic challenge was a pump failure. Figure 1. The slow sand filter was constructed of 4-inch diameter PVC pipe parts. Water samples were collected from just above the sand bed [pretreatment (PRE)] and after water had passed through the sand bed [post treatment (POST)]. 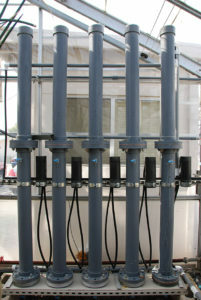 The slow sand filter columns were constructed of four-inch diameter PVC pipe. Water sampling ports were located immediately above (PRE) and below (POST) the sand bed. The sand (#60 Lapis Lustre sand) was rinsed with water and decanted several times to remove ﬁne particulate matter. The washed sand was oven dried, then used to fill the section of the column between the two sampling ports as shown in Figure 1. Figure 2. 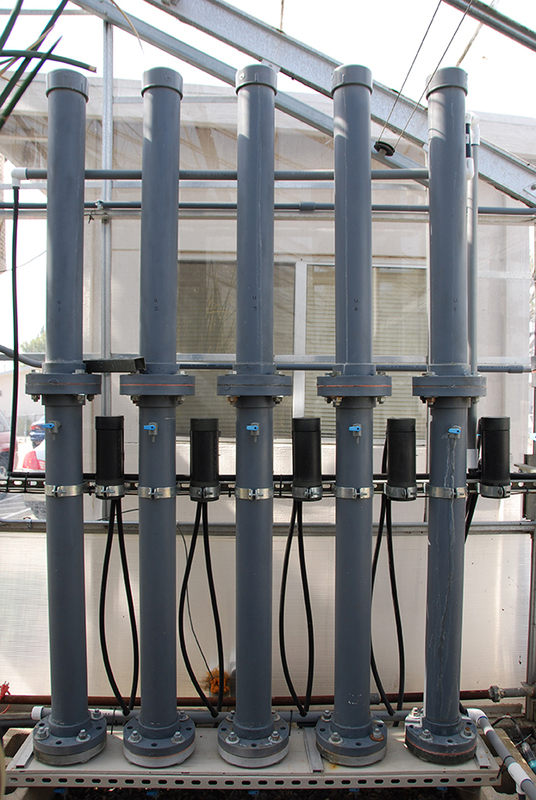 A set of our slow sand filter columns constructed and installed in a research greenhouse. Water provided to the slow sand filter was irrigation leachate collected from container-grown heavenly bamboo (Nandina domestica), red hot poker grass (Kniphofia uvaria), pineapple guava (Acca sellowiana), and Euonymus sp. Captured runoff water was pumped to the slow sand filters (Figure 2) for 30 days prior to addition of the pathogens, in order to establish a schmutzdecke. Water flow through each of the columns was regulated to maintain the rate at 20 mL·min–1. 3. Control group: Sterilized water filtered through the sand columns. The pumps were turned off at week 12 to simulate an interruption in water supply. For one week of “pump failure” water flow was restricted, allowing the columns to drain of water. Pathogen inoculation was also suspended while there was no water flowing. After a week off, the pumps were turned back on, and the previous daily inoculation continued. Water samples were collected weekly from the PRE and POST ports to determine the effectiveness of the sand filter. Sampled water was either introduced — directly for Fusarium, or Millipore filtered for Phytophthora — onto petri dishes containing growth media and incubated in conditions favorable to the two pathogens. 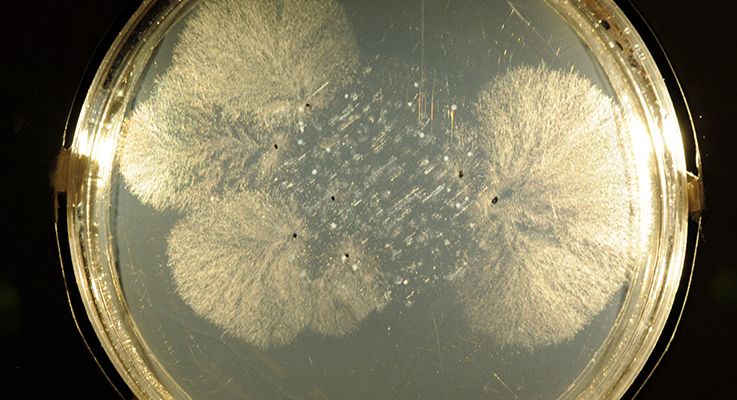 The pathogen presence on the incubated petri dishes was measured in colony forming units (CFU), which are a visual count of different colonies growing in the petri dishes. Figure 3. 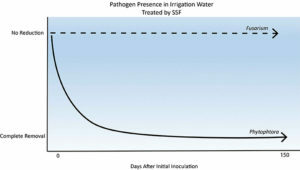 Graphical representation of impact of slow sand filters on pathogen colony forming units (CFUs). After approximately two weeks, 95 percent of Phytophthora capsici was removed from the irrigation water. By the fifth week, there was 100 percent removal, a trend that continued in spite of the simulated pump failure. Conversely, the presence of Fusarium oxysporum was never affected by the slow sand filter. Treatment by slow sand filter was successful, although not immediate. The slow sand filters exposed to P. capsici showed a high reduction efficacy even after the first week. By the fifth week after the initial inoculation, once the schmutzdecke had adapted to the pathogens, no P. capsici CFU were detected in the filtered samples under any condition (Figure 3), though numerous CFUs were found in the PRE samples (Figure 4). Moreover, the simulated pump failure did not adversely affect the reduction of P. capsici by the slow sand filters. Unlike the P. capsici, F. oxysporum was detected in POST leachate samples throughout the experiment. Neither the biotic nor abiotic stresses affected the presence of F. oxysporum in POST samples (Figure 3). This study found that even after a mechanical pump failure, a slow sand filter system is an excellent technology for controlling P. capsici, indicating likely efficacy against other Phytophthora and Pythium (i.e., pythiaceous) pathogens in a greenhouse/nursery setting. Yet, one consideration for adoption to a commercial scale is the rate and quantity of water that can be treated. The large volumes of irrigation water inherent to many nursery and greenhouse production settings would require large holding tanks to accommodate the slow flow rates. Space for this infrastructure may be limited. Regardless of technical constraints, the effectiveness of slow sand filter systems is continually being verified. Partial or total transition to slow sand filter systems will depend on site-specific considerations regarding disease pressure, costs of materials and operation, versus risks and cost avoidance. More details about this project and slow sand filtration in general may be found at: Lee & Oki. 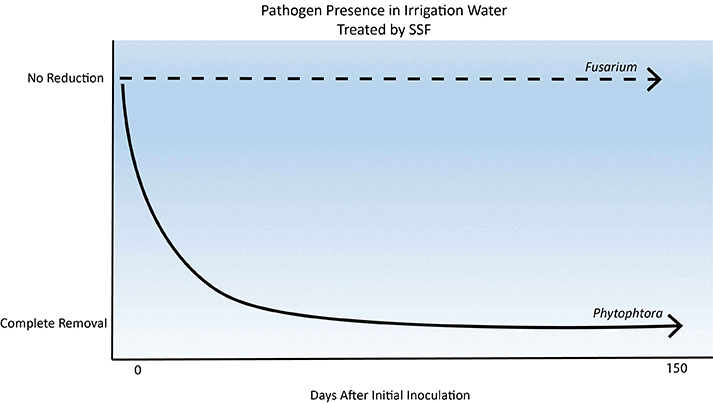 “Slow sand filters effectively reduce Phytophthora after a pathogen switch from Fusarium and a simulated pump failure.” Water Research 47 (2013). DOI: 10.1016/j.watres.2013.05.054.